Jason Hole was registered with Network Training Services on GQA Level 2 NVQ Certificate in Fabrication of Glass Supporting Structures in 2011. 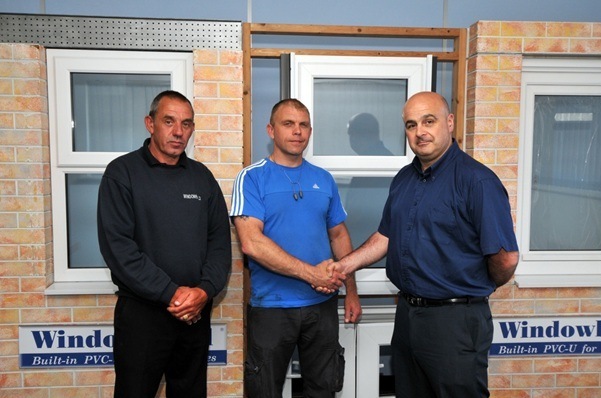 Jason, a fabricator at Windowbuild in Cardiff, completed the qualification framework in April 2012. 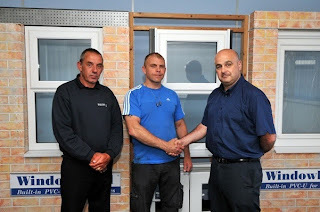 Jason’s assessor, Steve Kaged, of Network Training Services nominated Mr Hole for the VQ learner of the year award after being impressed by his commitment to and progress through the qualification process. Steve said: “It was a massive step for Jason to complete this qualification as his literacy skills were very limited and I am very proud that the first letter Jason wrote was about the framework we (Network Training) provided” Jason said: “I completed my course in April of this year and because Steve and I were always doing something it is now strange being off the course! I suppose I am missing learning, I would like to thank Steve and Network for all their help during my course”. The VQ Learner of the Year Award recognises leaners who clearly demonstrate progression and excellence in vocational studies and finalists are selected using a set selection criteria. After all nominations were considered Jason was named as Learner of the Year 2012 for Wales. Jason achieved this recognition for the content of his portfolio and his continued improvement to his learning skills. Jason received a framed certificate and a cheque for £100 presented to him by his employer who stated: “We are delighted that Jason Hole has been commended for work produced during his N.V.Q apprenticeship and how his training has benefitted Windowbuild as a company; this reinforces the message of how apprenticeships as a whole are invaluable in the current climate. Jason is a tremendous asset to the company”. Network Training Services based in Port Talbot, have been a GQA Centre for over 10 years, providing Vocational training for the Glass Industry within Wales.